Bulk body jewelry is the best deals you can get on sorted body jewelry. These special offers include assorted cheap bulk body jewelry packages in large quantities, offering you the cheapest wholesale bulk body jewelry deals anywhere on body jewelry. Bulk body jewelry assortments will contain body jewelry in various colors and designs unless otherwise stated in the item description. Please see the details on each deal for more information. Great quality surgical steel glued gem nose screw rings packed with acrylic display tray, 60pieces/tray, 5pcs/crystal color. Nose screw thickness available in 20ga,18ga. 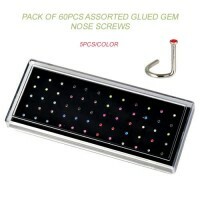 Great quality surgical steel picture logo nose bone packed with acrylic display tray, 60pieces/tray, 5pcs/picture logo. Nose bone thickness available in 20ga,18ga. Custom design picture logo welcomed. Great quality surgical steel picture logo nose bone packed with acrylic display tray, 40pieces/tray, 5pcs/picture logo. Nose bone thickness available in 20ga,18ga. Custom picture logo are welcomed. Great quality surgical steel glued gem nose bone packed with acrylic display tray, 60pieces/tray, 5pcs/crystal color. Nose bone thickness available in 20ga,18ga. Great quality surgical steel press-fit gem nose bone packed with acrylic display tray, 60pieces/tray, 5pcs/crystal color. Nose bone thickness available in 20ga,18ga. 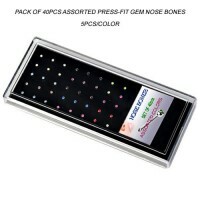 Great quality surgical steel press-fit gem nose bone packed with acrylic display tray, 40pieces/tray, 5pcs/crystal color. Nose bone thickness available in 20ga,18ga. Custom sticker label are welcomed. Great quality surgical steel glued gem nose bone packed with acrylic display tray, 40pieces/tray, 5pcs/crystal color. Nose bone thickness available in 20ga,18ga. Custom sticker label are welcomed.